The blog is not dead; I promise!! But, let me tell you, planning a wedding will keep you busy. Patrick and I are about to eclipse the 100 day mark and I couldn't be more excited to walk down the aisle to my handsome fella. If you noticed the last blog post was mid-January. Our wedding planning has been in cycles. After he first proposed (a year ago last weekend) was the initial cycle. I refer to this one as the "big" things. In my opinion the big things are what is necessary for your wedding to happen when you want it to; like, the venue, the caterer, the officiant, and the photographer. It took us about 2-3 months (or throughout the summer) to research and finalize these details. After this was completed we took a little break from wedding planning in the fall and throughout the holidays. All along I knew that we would get back into planning the next cycle once the 2013 New Year started. So after January 1st, sure enough we transitioned into planning the "medium" things. From January through April we research and finalized our cake, invitations, ceremony / reception music, flowers, rehearsal dinner, and other things. Now I feel like we're at another brief relaxing break... which is why I have time to blog! From mid-June to August will be the final cycle of all the "small" things and finalizing all the details. Patrick and I have still been cooking and trying new things. We were so excited when our CSA started back up just a few weeks ago. It's so nice to have fresh produce in the house. Obviously we've been very pleased with our CSA because this is our third season (read more here)!! Patrick picks up a box of produce weekly from the CSA drop off. We utilize the produce that spoils the fastest first. Today I have sweet potatoes that we haven't used yet and will make sweet potato gnocchi!! I'm actually blogging about the meal before it happens but there's another recipe to share which brings me to A Tale of Three Gnocchis. We first experimented with gnocchi last fall. The butternut squash gnocchi we tried was delicious and we even managed to blog about it; see this post. We had so much fun making butternut squash that we couldn't let the gnocchi fun stop! 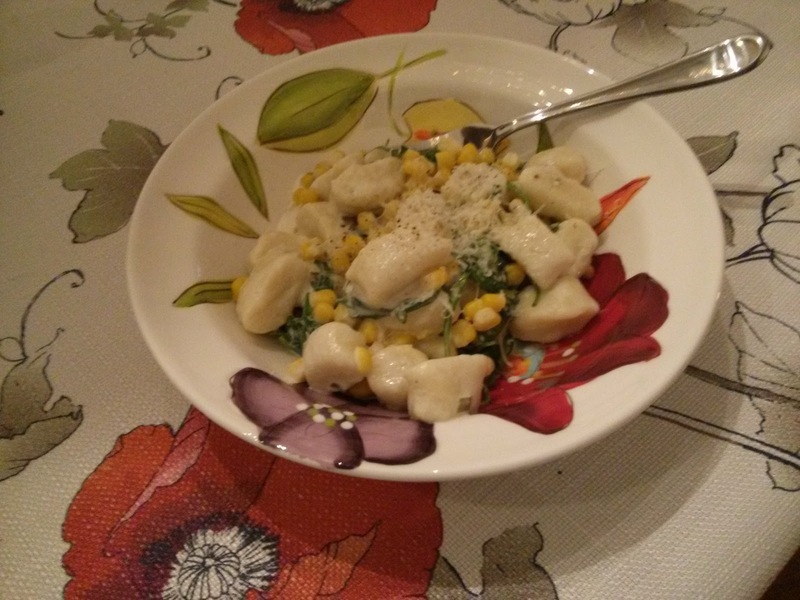 So in March we attempted a regular potato gnocchi. This did not get blogged since it was in the busy planning "medium" things cycle. 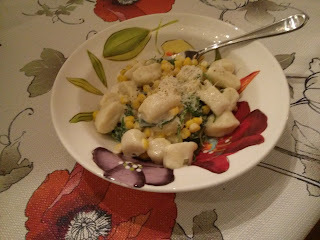 The recipe was from the Better Homes & Garden website: Gnocchi with Sweet Corn and Arugula in Cream Sauce. Unfortunately that recipe called for pre-made gnocchi and we couldn't eliminate gnocchi-making fun so I followed this Giada recipe for making the gnocchi. Today we're switching it up yet again and making sweet potato gnocchi! We will loosely follow this Giada recipe. However, I plan to saute some fresh mushrooms in the sauce and omit the maple syrup so it's not so sweet. Wedding parties help eliminate some stress from wedding planning! This group of wonderful ladies traveled with me to my shower this past weekend which was hosted by Glenda and her daughters in Sanford. It was such a wonderful day and I want to thank everyone who came and made it so special.